1. You can easily create proper shortcuts for Gmail from the settings page. 2. Now that's available offline, Gmail can truly become an application rendered by Chrome. 3. Some of the attachments are available offline and you can copy the files from Google Gears' cache. 4. Even if your Internet connection goes down, you can continue to read your messages and post replies, so you don't have to until the connection goes back up. 5. Gmail finally becomes usable if you have a slow or unreliable network connection. Enable the "flaky connection mode" and Gmail will cache your messages. "In flaky connection mode, you access the mail that's stored locally on your computer, regardless of your connection status. This makes it much faster to read and send mail, which is nice when you're on a slow or flaky connection. Your account will continue to sync in the background when it's able to do so, with no disruption to your experience." 6. Even if you have a fast Internet connection, it's faster to load data from your computer than from Google's servers, so the "flaky connection mode" is a good way to speed up Gmail. 7. 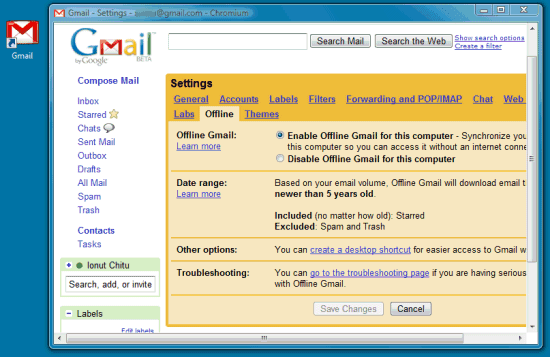 Most Gmail features work even when you are offline, including themes, Gmail Labs and keyboard shortcuts. 8. You can cache messages for more than one account and switch between them. 9. The change of the online/offline status is seamless and you don't have to manually sync data. 10. This is the best implementation of an offline Google app. My 'Red stars' disappear (they turn to yellow stars actually) if I go into 'Flaky connection mode', seems not all features are supported. Uh... welcome to last century? "Offline" email is exciting to gmail users? Weird. Firefox has already implemented the HTML 5 offline standard, but I'm concerned that it seems to only use a single SQLite database for everything (which if corrupted, mangles *all* of your data), while Gears uses a separate database for each site for safety and security. Also, I'm curious as to how the Gears->HTML5 migration will be handled. If I switch to using the browser rather than Gears, will I have to download all my data again? It's a long way off, but I hope someone is thinking about writing a migration tool. I looked over the HTML 5 spec at whatwg.org to answer my question about Firefox. I was confusing the application cache of section 5.7 (Offline Web applications), which Firefox implements, with the client-side database storage of section 5.10 (Structured client-side storage). But I still don't know what the migration plan will be when browsers implement client-side storage. Is flaky really good for all? I have good, fast, stable connection, should I use? Where does Gmail Offline keeps its data? Can we delete them manually if we decide not to use offline? The cleanest way to delete offline files would be through the Gears settings dialog, which in Firefox is at Tools->Gears Settings. I think you meant "became"? mmm well im not sure about this feature. and about google gears in general ; I mean could you guys please enlighten me here. - When / Why should i set up the offline mode ? I mean should i keep the offline mode on so that i get my mail permanently sync'ed to my harddrive and can read them on the train? But then will i still be able to receive emaisl leaving the offline mode on permanently? or should i just turn the offline mode when i unplugged my computer from my internet connexion and wait for hours before my mail is actually syn'd to my hard drive? "4. Even if your Internet connection goes down, you can continue to read your messages and post replies, so you don't have to WAIT until the connection goes back up." 2. Now that's available offline, Gmail can truly become an application rendered by Chrome. and prism or fluid!!!! I have got it enabled and all messages downloaded, now when I go to the mailbox even if I'm on-line and I click on the address bar I get "Your connection to this website is not encrypted" even when I'm using https://mail.google.com/. There's no padlock on my browser. Strange, is this normal?? It would be nice if the Google Team would update gears to work with the latest version of Firefox. I'm running 3.1b2 and am dead in the water. Gears should be looking for "3. *" not "3.0". When will an update occur? i don't know whether it means calendar will have a offline mode, if it is, i really appreciate that. I've turned it on on two machines and for both regular and apps IDs and it seems to be working pretty well. One problem I've noticed is that sometimes I have to hit "refresh" to see new messages even when opening the interface for the first time. I'm thinking it might have to do with the flaky connection mode which I turned on just to see what would happen. Nice. Granted, I already use GMAIL offline via Outlook and iMAP. Nice however since you can cut Outlook from the equation now (although I probably won't... yet). One issue that I'm having is that I have my data saved on a separate and much larger partition than my "C" drive. Google Gears, however, saves everything to C drive and after downloading messages and docs from two different hosted Google accounts, my C drive is running out of space. I use Google Chrome and can not find any Gears settings. Does anyone know if it is possible to configure where the Google Gears Caches is saved to? I really appreciate this. 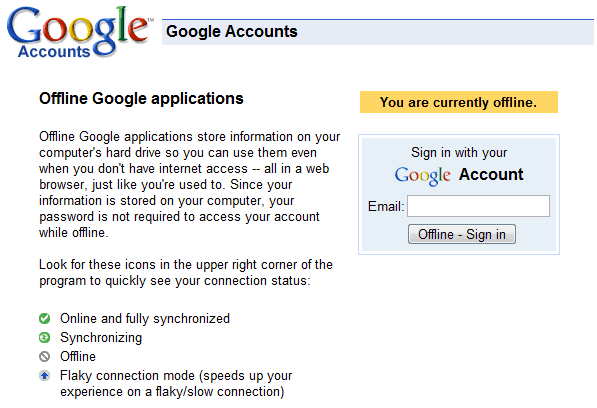 But is there a way to switch Gmail to offline mode manually even though I'm still connected to the internet? Yes, check the flaky connection mode. I agree that offline Gmail is great -- really, it drops the final barrier to businesses using Gmail for their domain names. Is there still any reason to use a desktop email program? The only thing I can think of is the lame 20mb attachment limit, which will hopefully be addressed with GDrive (or whatever Google ends up calling it). I'm still wanting to know how to set Gmail offline even when the computer is connected to the internet. Putting it on Flaky mode did not work. I tried to delete de attachments stored on my hard disk (something like 2Gb) but I wasn't able to locate them even following your instructions. Is there anyone who was able to delete them? Where data are stored on my hard disk? Same question. I want to use this as a backup for deleted accounts in Google Apps. Is it possible?